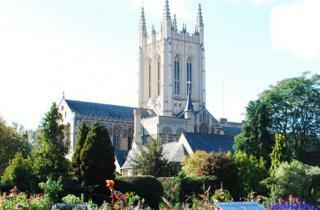 A special Christmas themed exhibition opens at St Edmundsbury Cathedral, Bury St Edmunds on Tuesday 1 December. The Big Gift exhibition is part of a county wide exhibition of artwork created by Suffolk school children. The Cathedral exhibition will be open from 10 am to 4 pm daily from Tuesday 1 December to Sunday 13 December. The title BIG Gift reflects the two aspects of the artwork on display. Local schools in Bury St Edmunds has created artwork linked to the theme of St Nicholas and other schools from further afield) and this work will sit alongside crib scenes which have also been created by school children in the county. Other cribs are exhibited at St Mary’s Church and at St Edmund’s Roman Catholic Church in Bury St Edmunds. ‘This exhibition follows on from the successful BIG Crib Exhibition in 2009 which marked the Year of the Child,’ comments Helen Woodroffe, Children’s Education Officer for the Cathedral and the Diocese of St Edmundsbury and Ipswich. The exhibition also provides an opportunity for local charities to profile their work and raise vital funds. Different charities will be helping to staff the exhibition each day, and any donations given will go directly to their charitable work. Established in 1936, Peel & Gudgin Opticians has an incredible reputation for a personal level of service and care.